ZANESVILLE, Ohio – Sometimes money does grow on trees. Forest manager David Glass from Blue Rock State Forest presented the annual Trees to Textbook return check to the Muskingum County Commissioners. Glass said the money comes from a timber sale done at Blue Rock State Forest and is then distributed to the county. “The total amount this year was $57,911.30, of which the county receives a portion, the township where the timber was harvested receives a portion, and then the local school district this year which is Franklin local school district receives the remaining amount,” said Glass. Glass said because they do not pay taxes on the state forest land, the Trees to Textbook program is a way they are able to give back to the community. “This is our annual Trees to Textbook, we don’t pay taxes, state land taxes, and this is the way we can return some of the local money back to the local state governments,” said Glass. 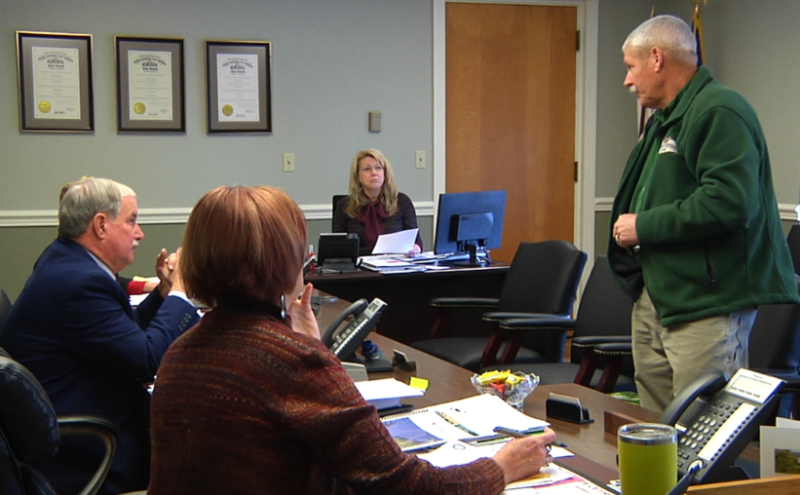 The Muskingum County Commissioners say the money they received for the county from the program will go toward the general fund.